Plans of the French government to raise taxes on gasoline and diesel have sparked much controversy recently. Data from the European Commission suggest that consumption of oil products has fallen significantly in the recent past as can be seen from the pictures below. In total, the situation looks as follows. Since the beginning of the financial crisis in 2008, overall consumption of oil products has gone gown. Oil is one of the major energy sources for a modern economy. Both, developed and developing economies depend heavily on it. So we may ask ourselves to what exent we depend on this critical source. Intuitively, we know that renewables are constantly gaining ground. However, the simple fact that oil prices continue to be a vital indicator for economic activity shows us that oil still keeps its dominant role in the energy mix. In order to find out how our dependency on oil and oil products has developed over the past decade, we compare the economic output in terms of nominal GDP with the respective oil consumption figures. This is done for the EU, the United States and Japan. The period in question is running from 2000 to 2010. 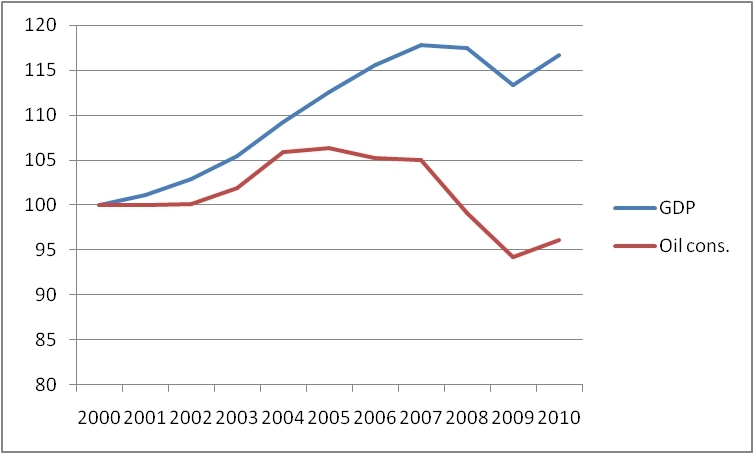 Both, the GDP and oil consumption are normalized to be equal to 100 in 2000. The raw data for our investigation have been taken from Eurostat and the Shell Statistical Review of World Energy 2011. Let us start with the European Union. Fig. 1 gives us a nice impression about the decoupling of economic activity and oil consumption which has taken place in the past decade. A net gain in real GDP is accompanied by a significant drop in oil use. Fig. 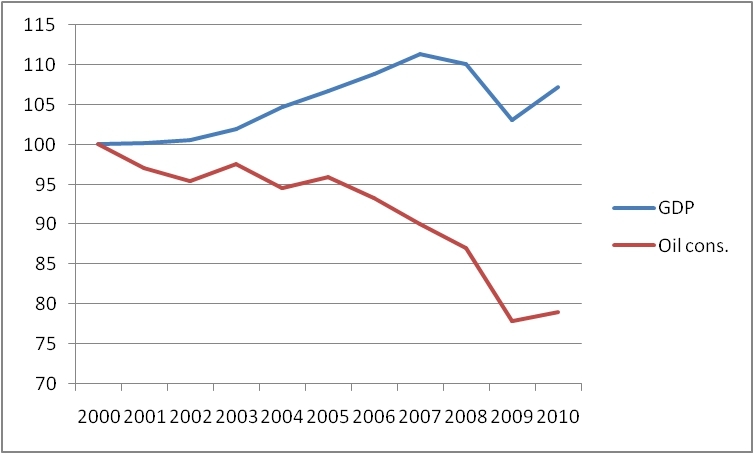 1 EU-27 oil dependency 2000-2010, 2000 = 100. The underlying reasons for this significant development are twofold: on the one hand, oil is facing competition from other sources such as natural gas. On the other hand, oil using machinery, like car engines etc. are getting more efficient, i.e. using less energy per km/mile. Fig. 2 displays the same analysis for the United States. Again, real GDP and consumption of oil are jeading in different directions. 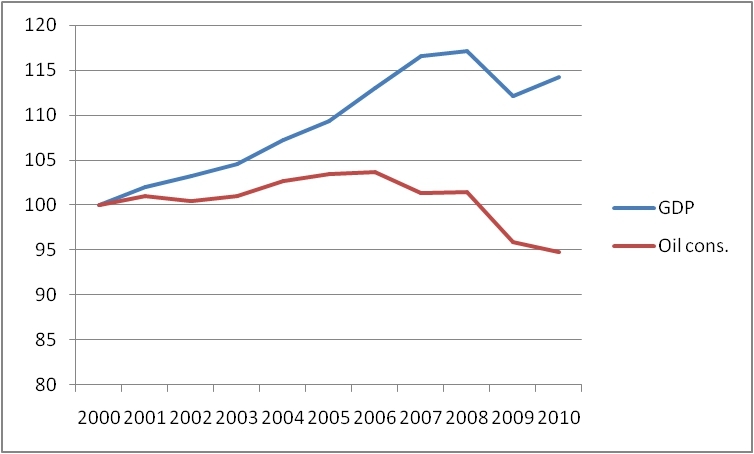 As in the case of EU-27, the decoupling becomes even more siginificant as of 2006/2007. Quite remarkably, during the economic crisis in 2008/2009 the relative drop in consumption was considerably bigger than the one in economic performance. As a final example, let us have a look at the situation in Japan. In one of our previous post we have already observed that Japan excels particularly when it comes to energy intensity, i.e. economic output per unit of energy used. Having this in mind, we would expect quite similar findings for the case of oil consumption. Fig. 3 shows the results of our analysis. Although Japan´s GDP has performed less favourably when compared to the US and the European Union, its oil dependency has fallen much stronger than the one of its competitors. The decoupling between economic performance and the respective oil consumption is already quite significant in the beginning of our observation period, getting larger during the years. Thus, the reduced consumption of oil and its products is one of the key factors in Japan´s successful struggle to obtain a higher economic output per unit of energy.